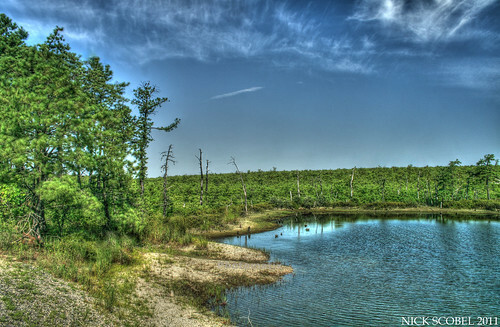 The pine barrens of southern New Jersey encompass 1.1 million acres and account for 22% of the state's total land area. It is a huge place, with large sections of coastal plain forest that make up the Pinelands National Reserve. This massive area stretches across Atlantic, Burtlington, Camden, Cape May, Gloucester, Cumberland, and Ocean counties in the southern part of the state. Pitch Pine (Pinus rigida) is the dominant tree species here, with a thick understory of Scrub Oak (Quercus ilicifolia) present in most areas as well. The pinelands are a diverse area in terms of habitat, wildlife, and herpetofauna. Several rare & endangered reptile & amphibian species exist here, including the Pine Barrens Treefrog, Timber Rattlesnake, Corn Snake, and Northern Pine Snake. There are many lakes, rivers, streams, and acidic bogs scattered throughout the pinelands. These wet habitats create unique conditions for many rare & endangered species. Carnivorous plants such as sundews, bladderwort, and pitcher plants can be found in these area. 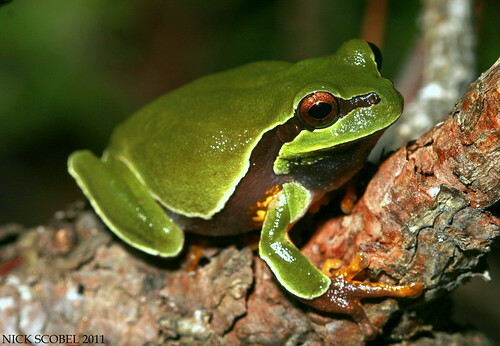 One rare species prefers these areas for breeding purposes, the Pine Barrens Treefrog. A small but beautiful treefrog species, the Pine Barrens Treefrog is only found in the pine barrens of New Jersey, North Carolina, and the pandhandle of Florida. Choruses of males can be heard near bogs from May through July, but it is rarely seen outside of the breeding season. Their call is not as impressive as the colors of the frog itself, but the loud kwonk-kwonk-kwonk is endearing. This species has suffered declines throughout its range due to habitat loss, especially in New Jersey. It is listed as a Threatened species by the NJDEP Division of Fish & Wildlife. Many other herps in this region have declined as well, but for additional reasons than habitat loss, like this beautiful snake. Though recent data suggests against the validity of this subspecies, the Coastal Plain Milk Snake is one of the characteristic snake species that is endemic to the pine barrens. It is unclear to exact identity of these snakes, but it is clear that they share genetic and phenotypic traits from both the Scarlet Kingsnake (Lampropeltis t. elapsoides) and the Eastern Milk Snake (Lampropeltis triangulum). 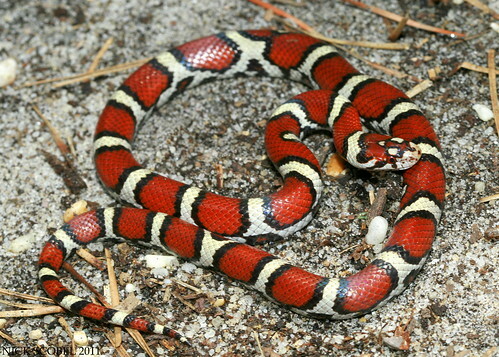 There are several hypotheses to the origin of the coastal, one suggests that it is a relict population of Red Milk Snake (Lampropeltis t. syspila). Another suggests that the ranges of the Eastern Milk Snake & Scarlet Kingsnake once overlapped thousands of years ago, and what remains is the result of that overlap. Regardless of their origin, the costal is an extremely attractive snake that needs to be conserved. Because of its colorful appearance, coastals are in high demand in the pet trade and many are collected when found. This species is a key component of pine barrens ecosystems and needs to be left where it belongs, much like the next snake species. 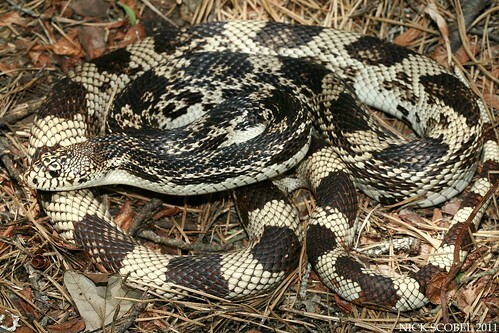 This is the king of the New Jersey pinelands, the Northern Pine Snake. A large, powerful constrictor that spends much of its time underground or under cover. It is the largest species of snake which occurs in New Jersey, attaining lengths over 6 feet. 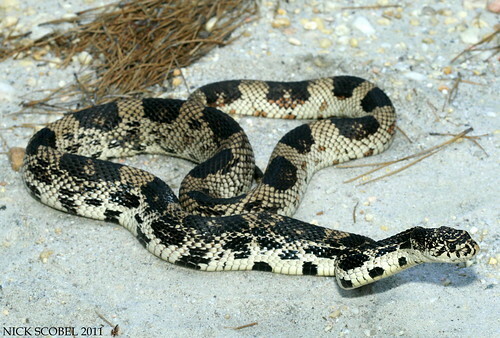 Like other members of the genus Pituophis, the Northern Pine Snake has a characteristic enlarged rostral scale which allows it to burrow in the sandy soils of the pine barrens. In the early summer, adult females excavate their own burrows and lay a clutch of eggs which hatch in August and September. Northern Pine Snakes feed on a variety of prey species which include rodents, other snakes, and occasionally birds. Unfortunately, this beautiful species has suffered significant declines and is listed as a Threatened species in New Jersey. Habitat loss and alteration is the leading cause to the decline of the Pine Snake in the state. 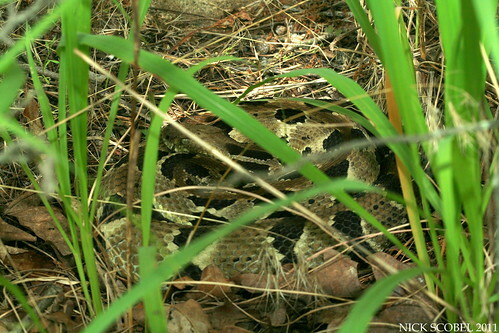 These snakes return to the same den sites every year for overwintering and for nesting in the summer. When these areas are wiped out due to development, it can cause catastrophic effects to a local population. 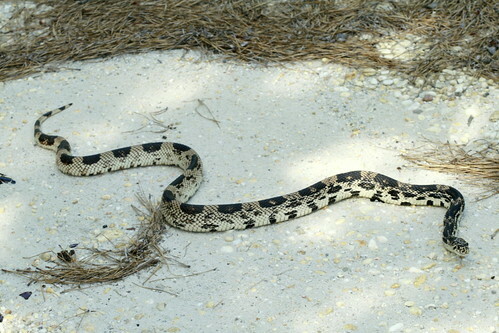 The development of pine snake habitat also means the creation of new roads, these fragment habitat and force these snakes to cross from one patch of habitat to another, often with fatal results. Besides road mortality and habitat loss, another reason that contributes to decline of pine snake population is us. Humans. With less and less habitat available, interactions between people and pine snakes are become increasingly common. 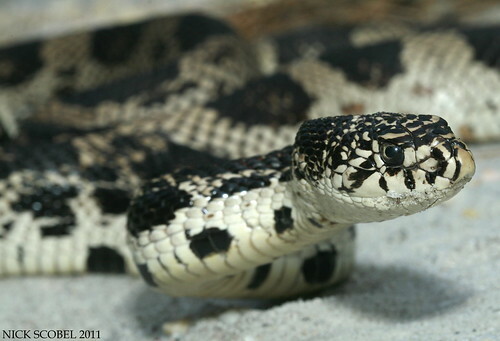 Because of their large size, striking appearance, and overall rarity in the New Jersey pinelands, the Pine Snake is a popular species for illegal collection. Too often, these magnificent snakes are taken from the wild and sold off to the highest bidder. But a lot of people don't share this opinion, many pine snakes are killed out of the ignorant belief that they are venomous or are mistaken for a rattlesnake. Their tendency to vibrate their tail, hold their ground, and hiss loudly often warrants them a cruel death from an ignorant visitor to the pine barrens. But it's not all bad news for the Northern Pine Snake, active research and conservation efforts are ongoing in the pinelands to ensure that this impressive snake will be around for the future. Another snake species that is in a dire situation in the pines and throughout New Jersey is this impressive serpent.. Listed as an Endangered species in New Jersey, the Timber Rattlesnake has probably received more persecution from humans than any other snake species in the state. Their are two distinct populations of Timber Rattlesnake in New Jersey; the montane population & the pinelands population. In both places, Timbers have declined steadily due to habitat loss, destruction of den sites, road mortality, illegal collection, and persecution by humans. 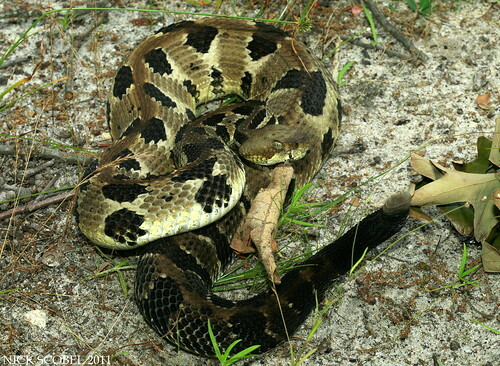 In the pine barrens, Timber Rattlesnakes overwinter in root systems of lowland cedar swamps and disperse into the forest throughout the course of the year. Gravid females search out sandy ridges in the pines where they can bask and gestate their young, like the large female below. The Timbers of the pine barrens are something special. Larger populations exist to the north in the mountains, and farther south in Virginia and the coastal plain of the southeast. But the pinelands of southern New Jersey present more than a million acres of coastal plain forest which makes the habitat this population inhabits much different than habitat for other populations in the northeast. The pine barrens population is extremely isolated, vulnerable, and seldom seen by people. One of the most common snakes in the pinelands that is seldom seen in the pinelands is this performer. 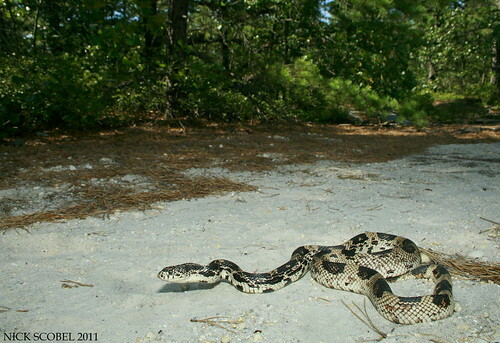 The Eastern Hognose Snake is a secretive species which is quite common throughout the pine barrens, but rarely seen. This is because its spends much of its time burrowing underground in search of its favorite food source, toads. This species gets its name from the upturned rostral scale on the front of the head which helps it dig in loose, sandy soils that are found throughout the pine barrens. 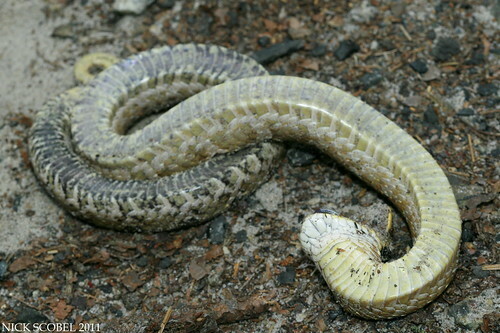 When first encountered, the Hognose will flatten its neck like a cobra and hiss, as the individual pictured above is displaying. If harassed further it will writhe about and then play dead, a very convincing display. 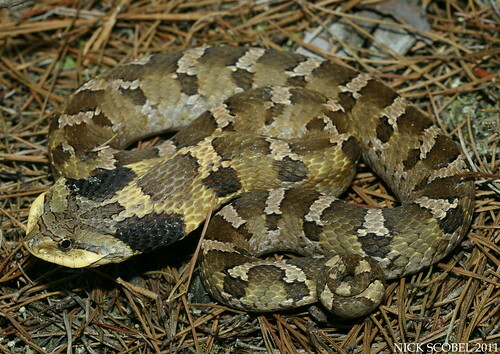 The Eastern Hognose snake is likely one of the most common species of snake that occurs in the pine barrens, likely due to the abundance of suitable habitat and prey availiability. 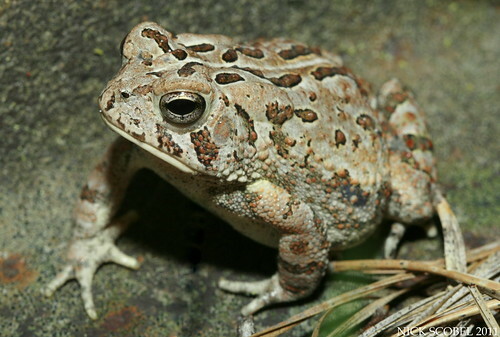 The Fowler's Toad is one of the most common species of herps found in the pines. Back in Michigan, this species is uncommon and only found on the west side of the state in areas where sandy soil abounds, this is no different than in New Jersey where this species is basically only found in the pinelands. 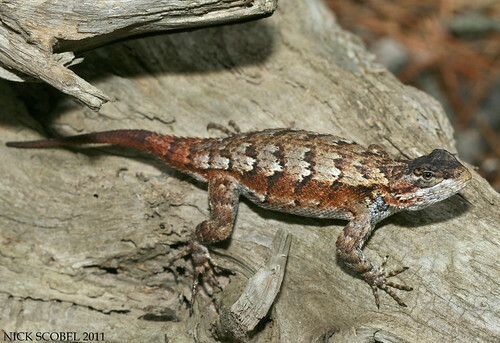 The Eastern Fence Lizard or "fence swift" is likely the most abundant species of reptile found in the pinelands of southern New Jersey. They can be found in open areas along logs, old foundations, railways, and basically any habitat found in the barrens. 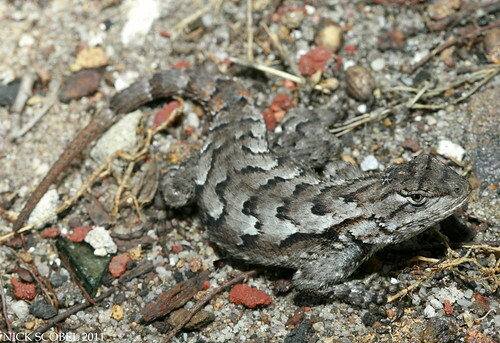 They are alert, agile lizards that usually make a hasty escape upon an encounter. This species is often preyed upon by the Eastern Kingsnake, a species I was not fortunate enough to find during my summer in New Jersey. The pine barrens gave me some memorable experiences that I won't soon forget, I look forward to returning there in the future in hopes of seeing some of these species again. Until next time, happy herping!